Business View Magazine interviews Chris McBarnes, Mayor of Frankfort, Indiana, as part of our focus on best practices of American cities. 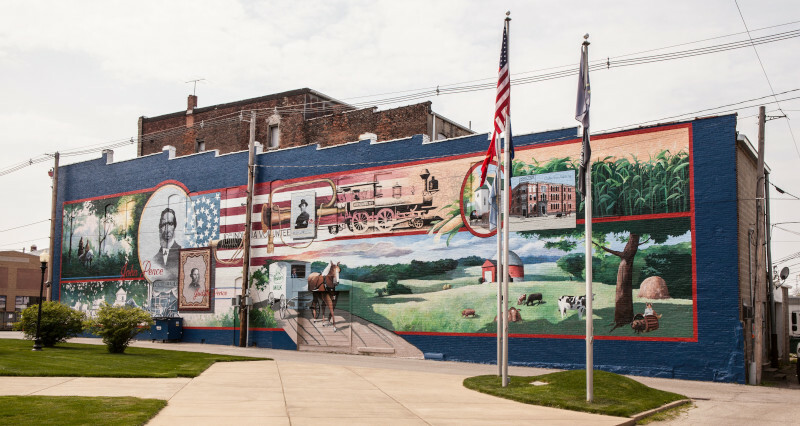 Frankfort, Indiana, the county seat of Clinton County, located in the center of the state, was originally laid out on a 60-acre tract donated by brothers John, William, and Nicholas Pence from Warren County, Ohio, in 1830. At their request the town was named Frankfort in honor of their great-grandparents’ home of Frankfurt am Main in Germany. At the turn of the 20th century, Frankfort became known as the “Gem City,” because of the brightness of its new electric lights which could be seen from miles away across the prairie. More recently, Frankfort is known as the home of the yearly Frankfort Hot Dog Festival, which, during the last weekend of July, attracts thousands of people from all across the Midwest. Today, Frankfort is a city of 16,400 with a very diverse economic sector based on manufacturing and food processing. 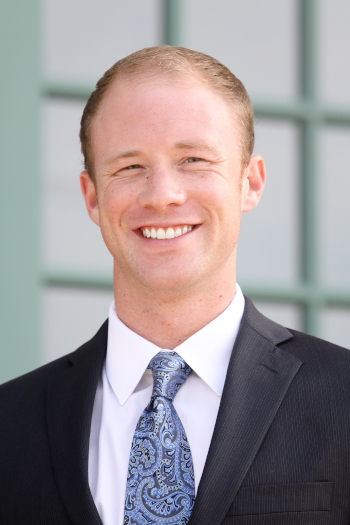 “With the agricultural sector being so strong around our community, we believe that we are the city that feeds the state that feeds the world,” remarks Chris McBarnes, who became the youngest mayor in the history of the city, when he was elected to his first term in 2011. “We do have the largest contiguous industrial park in the state, and we have the second largest Frito-Lay, globally, which is our largest employer. They employ 1,400 individuals, and across our industrial park, as a whole, we are near 4,500 employees.” Other major businesses in Frankfort include food giants Archer Daniels Midland (ADM), and Conagra Brands, which has its world-largest distribution center there. “At 1.6 million square feet, they had to take the curvature of the earth into account when they built the facility,” McBarnes notes. While the current economic climate in Frankfort is strong, when it comes to attracting new private investment to the city, McBarnes believes that economic development cannot depend upon the old paradigm of attempting to attract businesses by offering them incentives to relocate or expand, but rather by creating a “quality of place” that will attract the workforce of the future, thus making Frankfort attractive to the businesses that are going to need those workers. “So, what we’re focusing on is ‘quality of place,’” Mc Barnes continues. “We want to be a wonderful community for families to live, to raise their children, and we’re doing that by focusing on our green infrastructure. We just broke ground on our newest park in the city called Prairie Creek Park. It’s in the heart of our downtown, which makes it extra special. We took about half a city block that was derelict, with a crumbling building on it. It’s an $8 million development; we raised $725,000 from the private sector – the local businesses and corporations that helped build this project. It’s going to have a state-of-the-art stage and sound system. 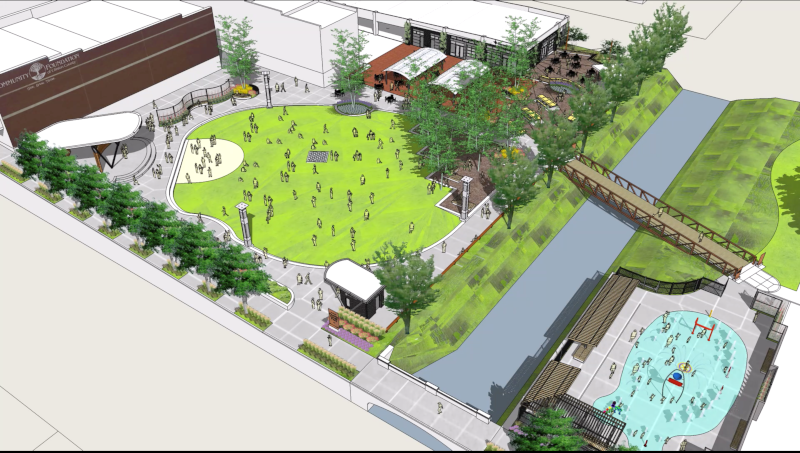 It’s going to have a splash pad, a pedestrian bridge, a vending area, another acoustic stage, outdoor play structures, and a linear playground. We plan on having programmed events at this park, year round. It’s going to attract thousands of people a year, and it will be the centerpiece for events like the Hot Dog Festival. “The nice thing about Prairie Creek Park is it’s right across the street from another major development in our community, the brand new Nickel Plate Flats, a $7.2 million, 72-unit, market-rate apartment complex. It has penthouses, studios, two-bedrooms. It is also sitting in a location that used to have a crumbling building on the site, and another that burned down in a fire. So, the city worked with the developer, Iron Men Properties, and we acquired the property and then the developer built this beautiful new, luxury apartment complex. It’s 91 percent occupied and 60 percent of the 81 percent of people living there had never lived in Frankfort, before. We believe that’s happening because urban housing is a very hot item. Millennials and retirees can move into Nickel Plate Flats, they can walk across the street and have a beer and a pizza, and then they can walk home. And this summer, their windows will be overlooking the beautiful, new Prairie Creek Park. “So, the theory of ‘if you build it, they will come,’ this idea of downtown revitalization, making our downtown the front porch of the community, and bringing back the charm that it had in the early 1900s, has been important to us. We know that these are the types of opportunities that top-tier talent and college graduates are looking for, and that’s why it’s so important that we focused on those two projects. “We’re also focusing on our transportation infrastructure. Every new road we build in the city, we’re tying not only to build it with the motor vehicle in mind, but also with the pedestrian in mind: the jogger, the bicycler, the young mom pushing a stroller. We have two major projects: Washington Avenue Phase One and Phase Two. They’re both around $3.6 million projects, funded 80 percent by the federal government. We’re able to apply for grants through the Indiana Department of Transportation that cover 80 percent of our roadway projects, which is really how smaller communities like Frankfort are able to accomplish multi-million dollar roadway projects. “This project will connect to two other ‘complete streets.’ A complete street is a street that has green infrastructure – it takes stormwater runoff into consideration, as well as pedestrians and motor vehicles. It will incorporate a multi-purpose trail on one side, a new sidewalk on the other. It will connect to a road that has new sidewalks on each side, which connects to a road that has new sidewalks and a bicycle path. We are building a trail network, strategically in our community, from our neighborhoods to city centers, whether it be our downtown, our TPA Park, or our golf course, or even our industrial park. We’re trying to make our city more mobile for our pedestrians and that’s been a big focus here for the past handful of years. “Economic development is competitive and we want industries to know that we’re not only working to retain our workforce with amenities such as housing, parks, and green space, but also we have tools to train them and then put them to work in our industrial park. So, another piece of ‘quality of place’ is education. We want to be a community where families know their kids can have a great education, not only in pre-school and kindergarten, but even post-secondary. So, seven years ago, we brought a community college to our downtown – Ivy Tech Community College. We took another derelict corner of our downtown; we partnered with the private sector and county government; we fundraised $2.1 million from the private sector and matched that with some public funds; and built a beautiful, new community college campus in the heart of Frankfort. “We are going to be approaching the City Council about launching what we are calling the Frankfort Promise Program. Any young person who lives in Frankfort and graduates with a high school diploma or a high school equivalency, if they want to go through the Ivy Tech Community College Foundation process, get a state scholarship or a school scholarship, and then if there’s a funding gap for them to receive that two-year degree or certificate, the City of Frankfort, partnering with Center Township of Clinton County and the private sector, will take care of those last dollars. So, we’re guaranteeing our young people that they can at least get an Associate Degree or a workforce certificate. “We just launched it and hope that it will be implemented this year. We’re going to put in $50,000 to start; Center Township is putting in $38,000 to start, and we have a goal of fundraising another $50,000 from the private sector. We believe, if we can get 15-20 students accepted into this program, this year, that will be a success. From that point forward, we’re going to work with our guidance counselors, our school superintendent, to make sure that we’re funding that appropriately, so that every child is given a chance, if they want it. Check out this handpicked feature on Hilton Head Island, South Carolina – A pretty special place.